Ireland have won the tri-series in Dubai after their final game against Scotland on Monday was washed out without a ball bowled. 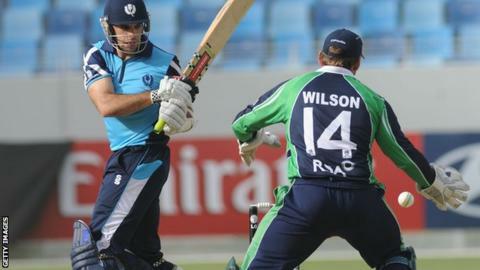 Persistent rain in the United Arab Emirates left the Irish a point clear of Afghanistan with the Scots a further point back in third. It is the first time there has been a no result in an ODI in the UAE. The tournament was used as preparation for the World Cup, starting next month in Australia and New Zealand. A shortened 20-over match was initially agreed but further rain left the officials with no option but to call the game off. Irish coach Phil Simmons had made four changes to the side that lost to Afghanistan on Saturday, with Stuart Thompson, Andrew McBrine, Peter Chase and Max Sorensen coming in. Ireland are back in action on 6 February when they play Sydney-based Randwick Petersham at the conclusion of a week-long training camp at the club. They will remain in Sydney to play Scotland and Bangladesh in official warm-up games on 10 and 12 February, before their World Cup opener against the West Indies at Nelson in New Zealand on 16 February. Scotland begin their World Cup group matches against New Zealand in Dunedin on 17 February, while Afghanistan face Bangladesh in Canberra on 18 February.